Warcraft « Grimoires of Supremacy! The time has come. We have a new expansion looming (well, it’s actually a long way away but still), and it’s time for Panda Steve to get all his ducks in a row and sort out what he wants to do, and when he wants to do it by. And maybe who he wants to do it on. Let’s start with the main, shall we? Sitting at a juicy 930, Shokei the Demonology Warlock is by far my most geared character. Aims? Get to at least level 75 on the artifact. This’ll be really easy, as she’s who I actively play as, and who I’ll be taking into Antorus every week. Complete the Affliction mage tower challenge. Apparently I need a particular legendary for this, Sacrolash’s Dark Strike. I’ve tried without it and I get absolutely mullered, so I throw myself onto the mercy of RNG. Still, having got both the Destruction AND Demonology appearances, getting the Affliction one would complete the set! Finish off Balance of Power I suppose? And maybe the Illidan stuff with Xe’ra? And get the class mount? Having been used quite a lot in the Nighthold, alongside Yopaat the Shaman, both their progress has sort of been halted by the resurgent Shokei. I may use Yopaat on and off in the future, but Lunchi’s a character I definitely want to get up to speed again, if only for the usefulness of having a backup healer in the guild. Current item level is a shocking 904, artifact level (Mistweaver) 50. Aims! Crank that item level up. Argus content will help with that. With the ever-increasing AK level we’re getting, firing up her weapon will also be relatively straight forward. Attempt the mage tower challenge on her again. It went very badly the last few times. If we get the opportunity for Antorus alt runs (and let’s be honest, we’re looking at another 9-12 months until BfA, so we definitely will), drag her along and throw magical mist clouds at people. Getting her to level 110. She’s 29 at the moment, and dungeon spamming. She loves it when Warlocks and Hunters leap off ledges in Gnomeregan without dismissing their pets. Please drag EVERY ENEMIES to us, it’s so fun. Getting her to a decent item level and artifact level. I’m gonna settle for a tidy 920 and eventual 70. Getting her some priest tier sets! Gotta look fabulous at all times! Taking more screenshots of her, because hot DAMN goblins are almost as photogenic as pandaren. Almost. Battle for Azeroth is literal decades away, but it doesn’t mean we can’t start readying our characters for the transition! New content ahoy! Sort of! This entry was posted in World of Warcraft and tagged battle for azeroth, Warcraft, World of Warcraft, WoW. Has quite a ring to it, doesn’t it? It makes you think of power and dignity and other assorted stuff like that, right? Well let me tell you, I sure don’t feel it right now. I seem to spend my time dogsbodying for that lazy mage Khadgar, performing meaningless errands for the disparate groups that pepper the Broken Isles, or babysitting so-called “champions,” telling them where to go and what to do. It seems the Kirin Tor are more interested in playing games with barrels than fighting the legion. Let’s take today. I went to Aszuna. I freed some of those morose demon hunters and killed their captors. I picked some weird fel flower. I extracted murloc eyes from their heads and stole a hydra’s egg. I killed a ghost, which is surely impossible as they’re already dead. Another ghost gave me a box with nothing of interest inside. Tomorrow I may well end up in Val’sharah doing other pointless errands. Ah, but you’re not here to hear me complain about my lot in life, are you? Yes, I do try and relax sometimes. I spend a lot of time in The Legerdemain Lounge. They do the nicest coffee on Azeroth, you know. A rich, dark Kun-Lai roast, none of this icy Highmountain rubbish. I enjoy the kick, it gives me the spark I need to make my own brews. Not coffee, mind, but potions. See, in my spare time I indulge in a bit of alchemy. I refuse to pay those scalpers at the auction house for herbs, mind, so I go and pick my own. I’ve got quite the knowledge of herbs now, though I still occasionally disintegrate Starlight Rose. Fat furry fingers, you know? The alchemy shop being opposite Like Clockwork is an annoyance though. Explosions and robots fighting day in, day out. At least I’m able to make potions without Deucus’s supervision. I still see Thrall occasionally. He likes to ask me if I’m taking good care of Doomhammer. Haven’t the heart to tell him it’s collecting dust in the care of some goblins, along with Sharas’dal. Sure, hitting things with a hammer is somewhat cathartic, but I don’t want to fall into that trap of “if all you have is a hammer, every problem looks like a nail.” I much prefer to keep my distance, less chance of being bludgeoned myself, you know? I don’t tend to socialise much. My fellow shamans tend to be rather stuffy and constantly in a state of elemental reverence, which is fine and all but take a break sometime, yeah? Not that other groups are better. The warlocks freak me out, the mages and paladins are full of themselves, the death knights and demon hunters are too… you know? Just too. Too much. And the druids? Worse than shaman! That said I do have a few friends I see every so often. There’s a warlock that seems less weird than the others, there’s a pretty cute monk I see meditating in Dalaran occasionally, and I know a rogue that opens locked boxes for me, and in return I give her potions. She’s got a missing eye too. Maybe I’ll ask her story one day? Maybe not. She seems like that might be a sore point for her. My eye? Oh it’s silly, really. You don’t wanna know. This entry was posted in World of Warcraft and tagged Warcraft, World of Warcraft, WoW, Yopaat. Apparently they did! Let’s start with a general hotfix (*salute*) first. Haste is now 11.1% more effective. What this means is you need 90 Haste rating to gain 1% Haste, whereas before you needed 100. This is a boost for damn near all classes and specs, as it’s pretty much FREE HASTE RATING YAY but the warlock spec it benefits most is Affliction, Haste being one of its best secondary stats along with Mastery. It only really amounts to around a 1% damage boost that everybody gets, but hey! Enjoy it. Whoa. 33% is a large number! Those that play Demonology are saying their Demonbolts hit like crazy now, and Demonology is a very very good turret spec, like Arcane Mages. Thing is, unlike Arcane, Demonology will also be very good at movement DPS, not as good as melee or hunters, but still a lot better than the other casters, so did we just see Demonology become the best spec in the game when you factor in every aspect of an encounter? @gahddo @Rygarius @WarcraftDevs It's 1/3. 1% per point. It’s safe to say that this is a pretty healthy buff. 10-15% higher DPS some people are saying. Gosh! Ah yes, my spec of choice. Devastation now causes the Warlock to gain 15% (up from 5%) of the Critical Strike stat from all sources. As an example! Raenah, my Warlock, currently has 1006 Critical Strike from her gear. 5% of this is 50.3, which is rounded to 50 and added on to her total to give her 1056 Crit. 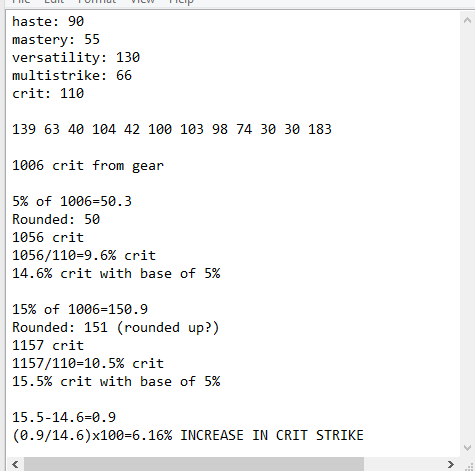 It takes 110 Crit rating to give a 1% boost, which means Raenah has a 14.6% chance of a crit, when you factor in the 5% baseline Critical Strike rating. With the new buff, 15% of 1006 is 150.9. I assume this gets rounded up to 151, and not rounded down, making her have 1157 Crit. This converts to a 15.5% Critical Strike chance, which is a boost of 0.9, which is a 6.16% increase from the previous number! The workings out for those who care? It’s basically nothing to be too excited about at this point, but as gear gets better and stats get larger, you’ll see more and more of an effect from this buff. Obviously it will boost Chaos Bolt damage slightly too, and higher crit means more embers and better AoEing, but for now it’s still a relatively small boost. We’ll see how well this shines when the gear scales upwards! Merry (LATE) Christmas, fellow Warlocks! This entry was posted in Warlocks and tagged Demonology, Destruction, hotfixes, Warcraft, Warlock, Warlords of Draenor, WoD, World of Warcraft, WoW. There’s four bosses in this place, and why not see what they have for the discerning Warlock of taste. You’ll notice that quite a lot of the armor you can get here are also available in other Heroic dungeons. It seems to be weapons, trinkets and the like that are exclusive, whereas other slots can drop from multiple bosses. Makes my life easier, I guess. Haste and Mastery are both tasty stats for any spec, so if you don’t have the legendary cloak (believe it or not, it’s still best in slot at this point!) this is a good alternative. Cloak of choice for Destruction, barring the legendary cloak. Decent third choice if you haven’t got the legendary cloak, and the Haste/Mastery one doesn’t drop. You really want the Arcane Mysteries one. Not this one. Good backup for any spec. These frosty boots leave me feeling COLD. Again, Versatility is a bit of a waste at the moment. Best for Demonology and Affliction thus far. You know by now what I am going to say. Good as a second choice. Demonology and DEFINITELY Destruction want this one! Versatility sounds so good on paper, but every other secondary is just way better. Whopping chunk of Multistrike which is lovely. That’s nearly 2% worth! A good chunk of Haste, but really any other stat would be preferable to Versatility sadly. Best choice for Affliction and Demonology, and a good second choice for Destruction because MASTERY. A brilliant piece for Destruction. No Mastery, but these are still a good drop for all 3 specs. Potential bonuses? Yes, this item can potentially be Warforged (6 item levels higher), have a Prismatic socket, Leech, Speed, or Avoidance. THEORETICALLY, you could get a Warforged item with an extra socket and one of the mentioned bonus secondaries, but I really wouldn’t get too obsessed with trying to get that, it would be ridiculously rare. That said, Crit is good for Destruction, so go wild. Not bad if you can’t get one with Mastery! Here’s the one you want for Destruction. Passable for the other specs too. Something worthy of the “fel” name! Destruction. Affliction? Demo? Go for it. Good as a backup for any spec. Another good backup. Multistrike is looking pretty good for Affliction, you know. Literally any other shoulder would be better. Affliction and Demonology ring of choice. Nice for Destruction too! The, um, other ring of choice. Crit makes it okay if you can’t get anything else. You probably can guess what I may say about Versatility by now, but the Mastery on this item makes it nice for any spec at a push. Awesomely named item, underwhelming inclusion of Versatility. Certainly best for Affliction and Demonology. Maybe Destruction too. Destruction is loving Crit, and Multistrike is always fun to see, let alone use. Possibly a better choice than the above. Marginally. Mastery! Versatility. There’s better out there. Demonology? Affliction? Go for this one. Probably best for Destruction. Sad there’s no Crit/Mastery robe. Your second choice for all 3 specs. This entry was posted in Warlocks and tagged bloodmaul slag mines, dungeon, heroic, loot guide, Warcraft, Warlords of Draenor, World of Warcraft, WoW. Also, it’s important to note that a lot of these pieces of gear drop from more than one boss! Weapons and trinkets appear to be tied to specific bosses, but other gear types can drop from many. Remember, all heroic dungeon drops are item level 630! There’s better weapons out there, probably. Good in a pinch for any spec if you can’t get anything better! Every spec likes Mastery! Every spec doesn’t really care about Versatility. Great for all specs! Destruction in particular. If you’re going for a 1H/OH combination instead of just plumping for a staff, this is good for all specs, but Teron’gor later on drops something better. ’cause Mastery. Every spec likes Mastery, and Affliction is liking Multistrike most at the moment. Item of choice for Affliction! Have a guess. You can do better. Every stat is so much better than Versatility at the moment. I mentioned this weapon above. If you favour a 1h/offhand setup, then this is your weapon of choice for Demonology and Affliction. This entry was posted in Warlocks and tagged auchindoun, dungeon, heroic, loot guide, Warcraft, Warlords of Draenor, World of Warcraft, WoW.